﻿﻿P﻿aneer tikka masala ﻿is an amazing mouthwatering dish, and a wonderful dish for any kind of formal dinner or occasion. Paneer tikka masala is a vegetarian alternative to chicken tikka masala, it is a similar but even better, high in protein dish. Paneer tikka masala cooked in reddish orange thick spicy gravy which not only appealing to look at but very tempting to eat. Here is a spicy, tempting recipe of Paneer tikka masala. In this recipe first chunks of paneer marinated in yogurt and spices and then grilled, and then cooked in the spicy rich gravy which is made with cashews, tomatoes, onion and aromatic spices, and to enhance the flavor kasoori methi (fenugreek leaves) added to the sauce. Grilling or roasting the chunks of paneer inhence the flavor of the dish. Traditionally paneer is grilled in tandoor but paneer tikka is very versatile, it can be grilled on gas grill, baked in oven or even pan fried. 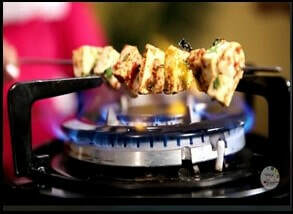 Paneer tikka can be served without the gravy as a snack or could use as a filling for a Kati kebab. 1. Cut the paneer into 1” wide and ½” thick cubes or the preferred size and place them in a bowl. 2. In a bowl, add yogurt, grated ginger, minced garlic, tandoori masala , salt, red chili powder, turmeric powder, garam masala, kasoori methi , lemon juice, melted butter or ghee and besan and mix them together and make a smooth mixture. 3. Add paneer cubes in the marinade and mix well so that they have a good coating of marinade. Cover the bowl and place them in refrigerator to marinate for 2 to 3 hours. 1. In a bowl add chili powder and turmeric powder and dilute them in 3 tablespoons of water and keep it aside. 2. Heat 2 tablespoon of oil in a frying pan on medium heat. Add chopped onions chopped garlic chopped green chilies and chopped ginger and sauté them for 6 to 7 minutes or until onions is translucent but not brown. 5. Transfer the sautéed onion mix into a blender and grind it to a paste. Add little water at a time to lubricate the onions for grinding. 6. In the same blender add chopped tomatoes and puree. 7. In the same pan onions were fried heat 4 tablespoons of butter. Transfer the onion paste in the pan and mix with butter and let it cook. 8. Transfer the grinded tomato puree in the same pan with the onion paste. 10 With the yogurt and tomato puree masala become watery, turn the heat to medium high so that water dry up quickly while frequently stirring so that masala does not burn. The onion masala might splatter while cooking, cover the pan and let it cook. 12. Add 2 cups of water and salt and let it cook for 10 to 15 minutes. Once gravy become thick add garam masala and ketchup and mix. Take the dry methi leaves (fenugreek leaves) and crush in between your both palms and add to gravy and mix and cook for few minutes. 13. Add sautéed paneer pieces in the gravy and cook for another 5 to 7 minutes or until you have the desired consistency of gravy. Turn the stove off. 14. Transfer the paneer to the serving bowl and garnish with chopped coriander leaves and crumbled paneer.